The colour concept of simultaneous contrast (technical term) is how a colour reacts when you put it next to another colour (or your own skin). 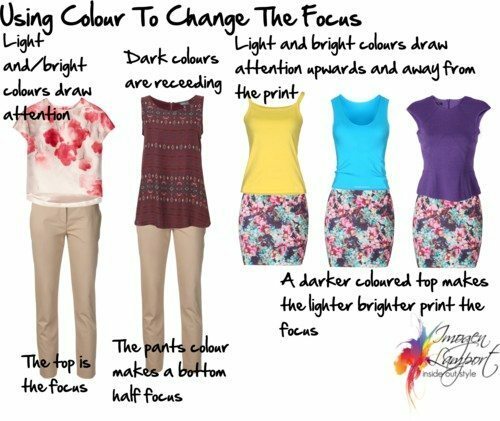 You can wear two light colours – the lighter of the two will draw the focus – just make sure your tops are lighter than your bottoms (but your bottoms don’t have to be dark. You can wear a pattern on the bottom, but if you want to draw attention upwards away from your bottom half, take a lighter or brighter colour from the pattern and wear it in your top. Soooo informative and interesting. Thank you Imogen for sharing your experience and knowledge so freely and lovingly. I’ve read every blog post you’ve ever written. This particular post is especially Interesting to me because I am determined to maintain a trans-seasonal wardrobe. I live in the coastal zone of Southern California. How do I utilize a brown skirt and light weight teal colored jacket during summer months without using the obvious, white? Thank you sooo much for your suggestions. Incidentally, I like your new hair and skin tone,,,much softer and you, two, are going through a wardrobe revamp. It’s exciting for your fans to watch your transition and to learn from you. I verified this just a couple of days ago. My colouring is deep and warm. I own a statement necklace made of aqua beads encased in gold hardware. When I’m dressed in black, an unflattering dark neutral on me, this necklace looks spectacular. I guess it sorts of “warms up” the black, since aqua+gold=warmer than black. I thought it would look good worn with dark brown too. The maths seemed perfect: flattering dark brown + flattering neclace = flattering outfit. I was so wrong: I spent the day spotting a ghastly face in every reflecting surface I passed by, like I was sick or terribly tired! I realized this was due to the relative properties of colours that you explain so well: when juxtaposed to the dark brown, the aqua colour diffused a cold vibe that made me look ten years older… interesting, isn’t it? This post is so informative and has started to make me think of possible combinations in my own wardrobe. Having just read your posts about lightening your hair – and the previous comment – it would be interesting to read more about how changing our hair colour affects the colours we can wear. My hair is naturally dark and I’m still getting it coloured. When my hair is at its darkest I can wear cool, jewel toned tops and scarves near my face. However when my hair has been bleached a golden colour by the sun, I have to re-think which colours look best on me. Perhaps I need lighter colours in the summer and darker ones in the winter months? Or maybe change the colours I wear on my bottom half, as shown in this post. This post seems to be about shade and intensity of two colors together, but Im wondering are there any techniques (conceps) or to adjust the under/overtone of an color other than using gold or silver jewelry? Since my colorings are closer to the neutral range and can wear both gold and silver, I often mix warm and cool colors together because wearing neutral, warm or cool colors from head to hehtoe wash me out terrible. I look sick if I wear taupe with grey and purples or wearing alot of browns in one outfit. It make my skintone looks muddy. When I wear black with gold and a muted color, Its usually look ALOT better on me, than keeping all in same color properties, especially undertones. This seems to contradicts with some of your theories when it comes to combining colors. But I notice while experiementing with color combinations, one thing that are always occurs to me is that Ive no problem “warming up” a cool colors like grey with yellow or icy colors with gold, but when I try to do it with warm colors, it doesnt look as appealing, because I find that warm colors like tan and olive are more prominant than lets grey and black. Ive never liked tan, olive or brown with silver and grey for some reason, but I love wearing gold with just about any color except for icy greys. Im not sure if this is just a matter a preference or has to do with the theories like the one in this post. I have never heard about simultaneous contrast before actually! Btw: Personally I find a muted color with a bright color make the bright color looks more dull, not make the soft color looks duller! (but this must be a personal preference from my part. :P) I always use muted earthtones (navy, burgundy, olive, brown, taupe etc instead of pure black) to tone down bright colors and thats a reason why I love grey with yellow. How interesting, as always!. I’m around trying to play this game, I’m changing my coppery hair dyed platinum with a chemical cousin then leave me my gray (gradually). The problem is I have my closet full of warm colors and feel I still have a little warm complexion with caramel eyes. Any suggestions that might help in this transition to the colder side? When you start to go gray, be aware that your skin tone is a greater factor in determining whether you can wear warm, cool or a combination. Many women ditch their warm clothes when they see cool gray appearing in their roots, assuming they need to cool down. There are many examples of stunning warm skin ladies with gray hair. Once you start looking, the contrast between their skin and hair is striking. Perhaps Imogen can address this, too! 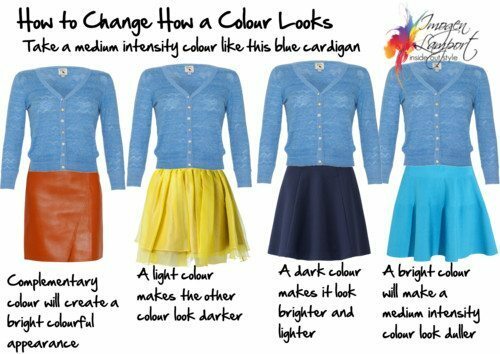 I would just like to add that the example of the bright skirt making the medium intensity top look duller also applies to your face. Unless your natural coloring is “bright” (as it would be with dark hair/light skin; bright intense eyes, etc.) a bright color worn ON TOP will make your face look duller. This is one of the premier principles of personal color analysis. To determine how much brightness you can wear near your face (clothes/makeup) without it making YOU look duller. Nice post Imogen. Yes too true – a face will become more muted in comparison to a bright top! Why does a bright complimentary colour brighten the outfit and yet another bright colour dulls the colour – what is it about complimentary colours? Does this also apply to any of the other colour combinations- monochromatic, analogous, split complimentary and triadic ? What do you think Edwina? Great ideas!….You have no idea how many times when I’m shopping I recall things you say here that help me in the decision process. It really feels empowering. This week I got some shoes that beautifully repeated the color / tone of my hair. You would have been pleased! Thank you! I am subtly warm toned, with teal eyes, pale skin and medium brown hair. I recently wore a teal top underneath a grey suit and I looked like I was quite ill. I wonder if that same teal with warm brown would be more appropriate, or perhaps a chunky silver necklace. The grey suit is lovely with a coral pink shirt. Maybe the grey is too cool for you, and the teal (not the warm end of the spectrum, unlike coral, which will give you skin a lift) makes the whole outfit appear cool. The brown and teal would make you look better. Imogen, your articles show as well as tell and I like that. I would like to use your article on contrasting colors on my color blog if you are okay with it. I have learned so much from your blog posts. That’s fine as long as you link it back to the source. Please send me a link.